I have a friend who works at the local elementary school and, while she loves her job, she loves nothing better than a snow day, as that means a fun day of stamping and card creating. I made this card to celebrate her next snow day! It is an A4 card folded in half portrait style. I really just used bits and pieces of my stash to make it. On the front the top and bottom pieces are from green glitter paper. I used a bit of blue sheer ribbon over them to get that interesting prism effect. The snowflake paper is from K and Co. The little paper doily is from the Dollar store and all the snowman, sledding girl and the tall skinny pine trees are peel off stickers I found at a scrapbook store in Pigeon Forge, Tennessee. Same goes for the Chill logo. I punched it out with a scallop punch and inked the edges in blue. I finished it off with some snowflake bling and 3 adhesive gems. I have severe arthritis in both thumbs so I need to rely on a lot of peel and stick embellishments. Fortunately, there are a lot of fun, lovely things out there for folks like me. Following Christina's example I decorated the inside of the card as well with coordinating paper and ribbon. I can't wait to send it to Elishia on her next snow day. Thanks Christina for being such an inspiration. Love everything you do! 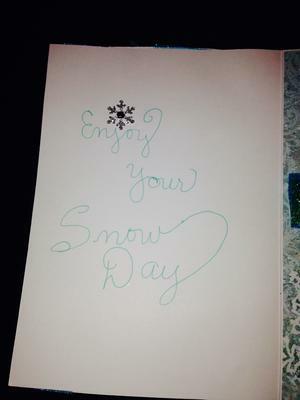 Your friend is going to be delighted with her card when the snow day arrives. And I am sure that she will treasure it for a long time to come. 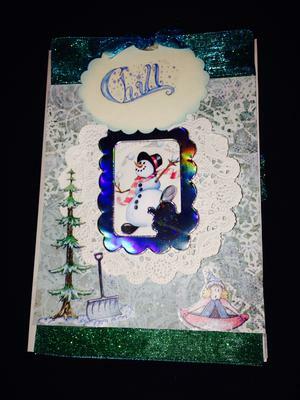 I like how you have used the left over bits in your "Stash" to make the card and get such good results. It always pays to be a frugal crafter and get as much mileage out of your stuff as you can. Thanks Edith! We are expecting snow tonight so I'm getting that card out tomorrow. Tell me the title of your cards in the gallery and I'll look for them. WHAT A KIND THOUGHT TO DO THIS CARD NOT MEANT FOR A PARTICULAR EVENT, BUT TO SHOW YOUR FRIEND THAT YOU THINK ABOUT HER AND WHAT SHE DOES.